What? I’m into cakes this week. Are you not? You are. 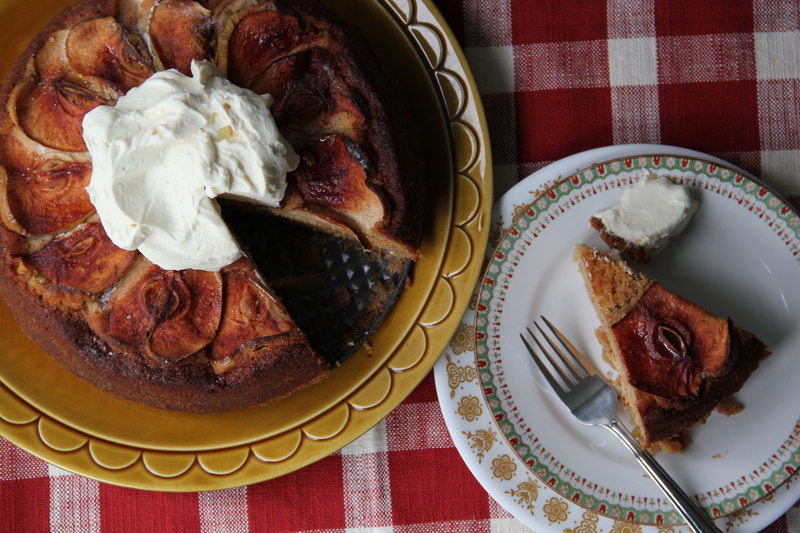 It being the eve of Rosh Hashana and all, I thought I’d bake you an apple honey cake, to help you ring in a sweet new year. Jewish New Year’s Resolutions? Do we do that? Let’s. Wear more hats. Both metaphorically and physically. I look good in hats. Run and walk and jog and things. Exercise. Stop overappreciating yoga pants. Jeans are okay, too. Skirts, even. Acknowledge more. Friends, family, adventure, chocolate. Smile and love and appreciate. 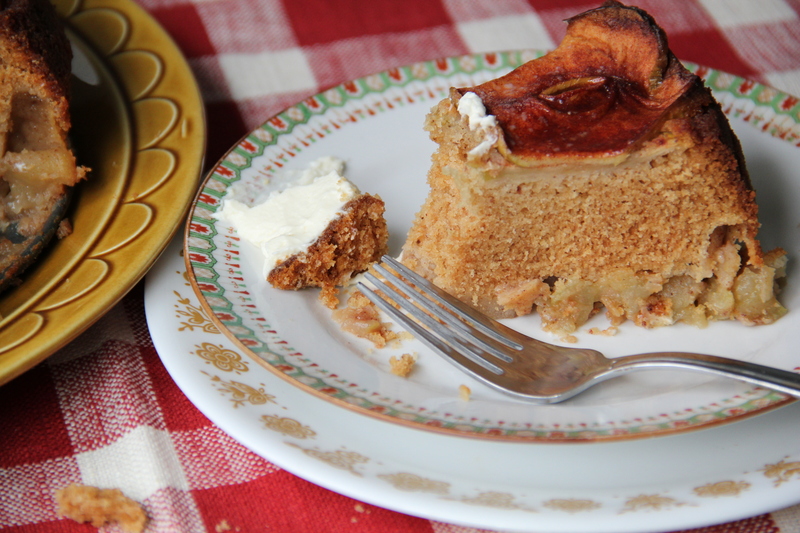 I serve this sturdy, toothsome, faintly sweet and appley cake with a mess of honey-sweetened, whipped mascarpone, but if you’re getting your brisket on and trying to keep kosher, leave it off. You won’t miss it. That much. Preheat oven to 350 degrees, and butter a 9-inch springform pan. In a medium bowl, combine the apple chunks with lemon juice, zest, and 1 teaspoon cinnamon. Tumble apples into the springform pan, layering evenly. In a small bowl, whisk together the flours, remaining teaspoon cinnamon, nutmeg, cloves and salt. In the bowl of an electric mixer, cream together butter and sugar until fluffy. Add honey and mix until combined. Add eggs, one at a time, then almond extract. Scrape the bowl to make sure the batter is well-mixed, then pour batter over apples in the pan. 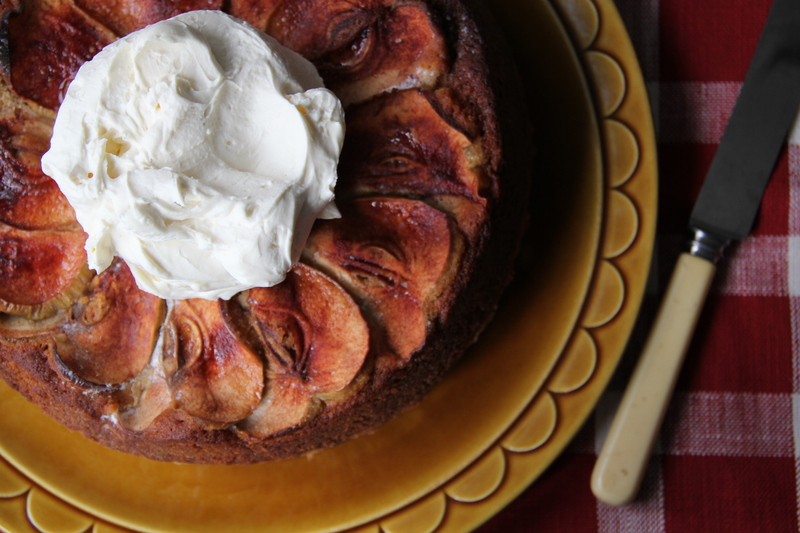 Before putting the cake in the oven, decorate with apple slices: thinly slice four apples lengthwise (between 1/8-inch and 1/4-inch slices), right through the core. Discard the seeds and stem, but keep your slices intact. Gently layer the slices in a concentric circle on top of the cake batter. Now you’re ready to bake. Bake the cake for an hour and 15 minutes, until the top has browned, the cake has shrunk from the sides of the pan and a knife inserted in the center of the cake comes out clean. To make the honey mascarpone topping, whip the mascarpone until good and fluffed (I used the whisk attachment on my stand mixer), then add the teaspoon of honey and whisk until incorporated. Serve immediately.